Laser print cartridges are specifically designed to assure optimal print quality, with crisp, dark output from first print to last. A clean hands design means easy cartridge installation and removal. This print cartridge comes with oiled fuser wipers for customers that do extensive label printing. For use with Optra S 1250(n), 1620(n), 1650(n), 2420(n), 2450(n) and Optra S 1255(n), 1625(n), 1855(n) and 2455(n). Yields 17,600 pages at 5 percent coverage. 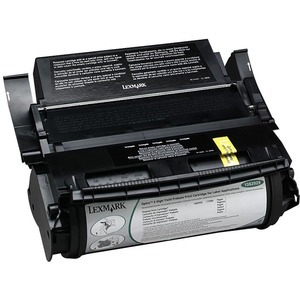 Lexmark Return Program Cartridges are sold at a discount, versus the prices of regular cartridges, in exchange for the customer's agreement to use the cartridge only once and return it only to Lexmark for remanufacturing or recycling.